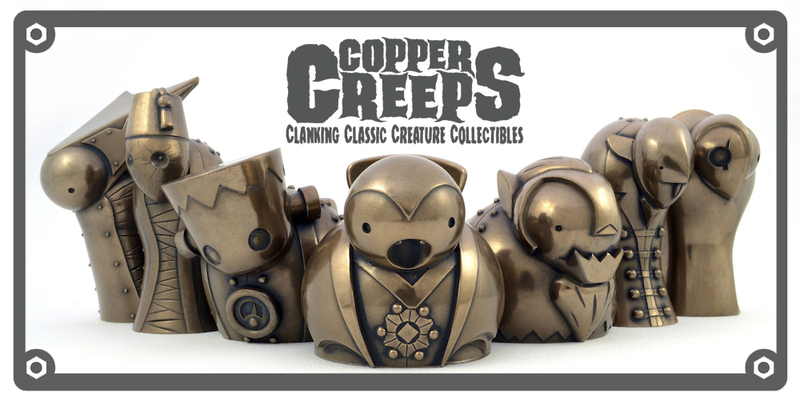 Copper Creeps are a series of resin figures inspired by famous movie monsters of the past. These stylish robotic interpretations of all your favourite iconic monsters will elevate your collection to the next level. You will feel your movie monster collection is complete when you add these unique versions of the classic creatures you love so much. They look stunning on your work desk or in your cabinets. Complimenting your existing collection by adding an exciting new twist to those classic designs. The figures were all designed and sculpted by award winning toy artist Bruce Whistlecraft (aka Doktor A). Each piece is lovingly and individually hand cast and finished in England by Baroque Designs. They are sold individually, boxed in simple packaging with a striking metal foil label.